There are a lot of PHPUnit posts on our site already (just check the tag), but it’s been a while since we’ve actually introduced people to it, and the tool has evolved significantly since then. This article aims to re-introduce the tool in a modern way, to a modern audience, in a modern PHP environment – if you’re unfamiliar with PHPUnit or testing, this post is for you. Here we assume you’re familiar with object oriented PHP and are using PHP version 7 and above. To get an environment up and running which has PHP 7 pre-installed, and to be able to follow instructions in this post to the letter without getting tripped up, we suggest you use Homestead Improved. Note also that some command line usage will be expected, but you will be guided through it all. Don’t be afraid of it – it’s a tool more powerful than you can imagine. 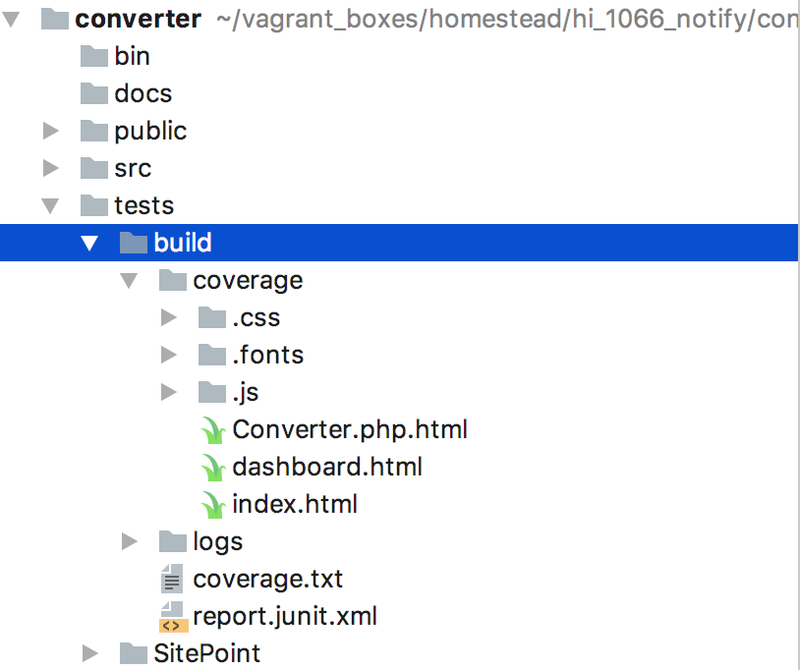 If you’re wondering why we’re recommending everyone use a Vagrant box, I go in depth about this in Jump Start PHP Environment, but this introduction of Vagrant will explain things adequately as well. 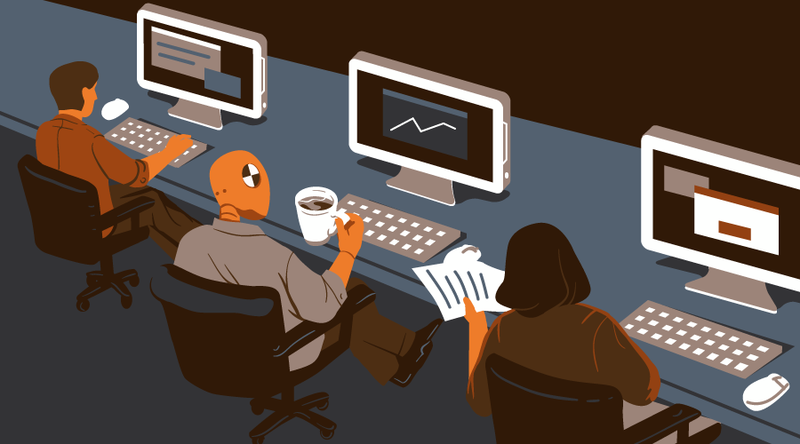 What exactly is Test Driven Development? Test Driven Development is the idea that you write code in such a way that you first write another bit of code the sole purpose of which is making sure that the originally intended code works, even if it’s not written yet. Checking if something is indeed what we expect it to be is called asserting in TDD-land. Remember this term. For example, an assertion that 2+2=4 is correct. But if we assert that 2+3=4, the testing framework (like PHPUnit) will mark this assertion as false. This is called a “failed test”. We tested is 2+3 is 4, and failed. Obviously, in your application you won’t be testing for sums of scalar values – instead, there’ll be variables which the language will replace with real values at run-time and assert that, but you get the idea. PHPUnit is a collection of utilities (PHP classes and executable files) which makes not only writing tests easy (writing tests often entails writing more code than the application actually has – but it’s worth it), but also allows you to see the output of the testing process in a nice graph which lets you know about code quality (e.g. maybe there’s too many IFs in a class – that’s marked as bad quality because changing one condition often requires rewriting as many tests as there are IFs), code coverage (how much of a given class or function has been covered by tests, and how much remains untested), and more. In order not to bore you with too much text (too late? ), let’s actually put it to use and learn from examples. The code we end up with at the end of this tutorial can be downloaded from Github. To drive the examples home, we’ll build a simple command line package which lets users turn a JSON file into a PHP file. That PHP file will contain the JSON data as an associative PHP array. This is just a personal use case of mine – I use Diffbot a lot and the output there can be enormous – too large to manually inspect, so easier processing with PHP can come in very handy. 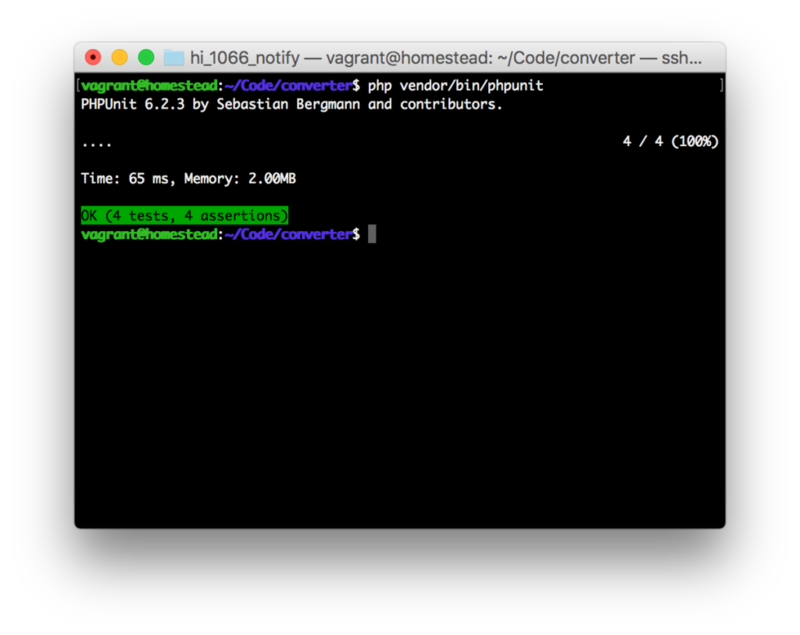 Henceforth, it is assumed that you are running a fully PHP 7 capable environment with Composer installed, and can follow along. If you’ve booted up Homestead Improved, please SSH into it now with vagrant ssh, and let’s begin. First, we’ll go into the folder where our projects live. In the case of Homestead Improved, that’s Code. Then, we’ll create a new project based on PDS-Skeleton and install PHPUnit inside it with Composer. Notice that we used the --dev flag to only install PHPUnit as a dev dependency – meaning it’s not needed in production, keeping our deployed project lightweight. Notice also that the fact that we started with PDS-Skeleton means our tests folder is already created for us, with two demo files which we’ll be deleting. You should be familiar with all the above contents. With our “Hello World” contents in place, let’s make sure we can access this from the browser. If you’re using Homestead Improved, I hope you followed instructions and set up a virtual host or are accessing the app via the virtual machine’s IP. You may be wondering why we need the front controller with Hello World. We won’t be using it in this tutorial, but later on as we test our app as humans, it’ll come in handy. Regardless, it won’t be part of the final package we deploy. A project can have several test suites, depending on context. For example, everything user-account-related could be grouped into a suite called “users”, and this could have its own rules or a different folder for testing that functionality. In our case, the project is very small so a single suite is more than enough, targeting the tests directory. 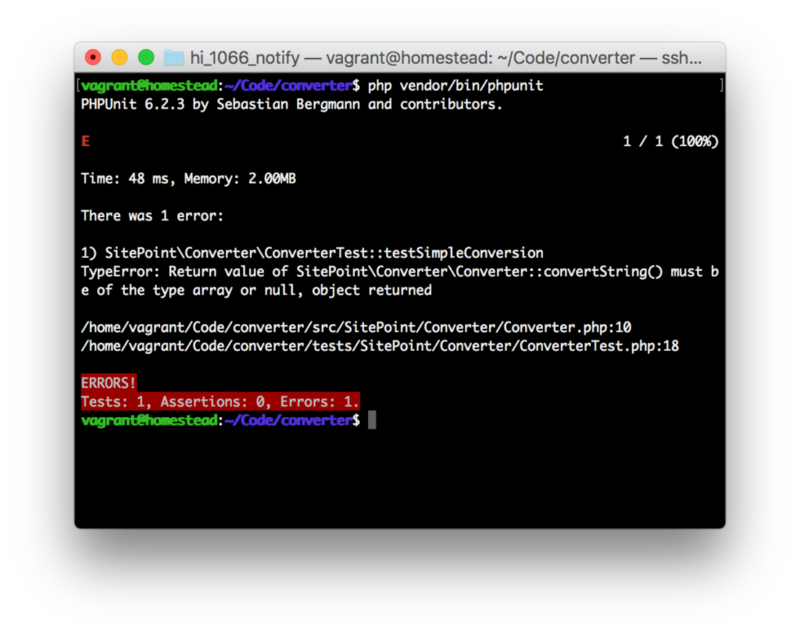 We defined the suffix argument – this means PHPUnit will only run those files that end with Test.php. Useful when we want some other files among tests as well, but don’t want them to be run except when we call them from within actual Test files. You can read about other such arguments here. After this, we run composer du (short for dump-autoload) to refresh the autoloading scripts. Remember, TDD is the art of making errors first, and then making changes to the code that gets them to stop being errors, not the other way around. With that in mind, let’s create our first test. It’s best if the tests follow the same structure we expect our project to have. With that in mind, we give them the same namespaces and same directory tree layouts. Thus, our ConverterTest.php file is in tests, subfolder SitePoint, subfolder Converter. The file we’re extending is the most basic version of the Test class that PHPUnit offers. In most cases, it’ll be enough. When not, it’s perfectly fine to extend it further and then build on that. Remember – tests don’t have to follow the rules of good software design, so deep inheritance and code repetition are fine – as long as they test what needs to be tested! This example “test case” asserts that the string Hello is equal to the concatenation of Hell and o. If we run this suite with php vendor/bin/phpunit now, we’ll get a positive result. 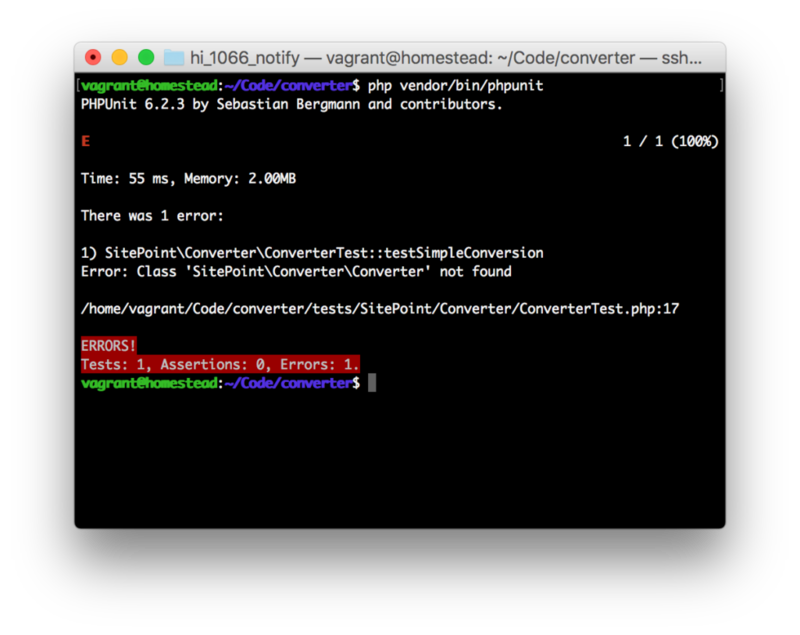 PHPUnit runs every method starting with test in a Test file unless told otherwise. This is why we didn’t have to be explicit when running the test suite – it’s all automatic. Okay, so what’s going on here? We’re testing a “simple” conversion. The input is a JSON string, an object stringified, and the expected output is its PHP array version. Our test asserts that our Converter class, when processing the $input using the convertString method, produces the desired $output, just as defined. A failing test! Expected, since the class doesn’t even exist yet. Now, we begin the process of making this test pass. Our first error is: “Class ‘SitePoint\Converter\Converter’ not found”. Let’s fix that. Progress! We’re missing the method we invoked now. Let’s add it to our class. We defined a method which accepts an input of type string, and returns either an array or null if unsuccessful. If you’re not familiar with scalar types (string $input), learn more here, and for nullable return types (?array), see here. This is a return type error – the function returns nothing (void) – because it’s empty – and it’s expected to return either null or an array. Let’s complete the method. We’ll use PHP’s built-in json_decode function to decode a JSON string. Let’s see what happens if we re-run the suite. Huzzah! Our test now passes! It gets the exact same output we expect from it in the test! … but something feels wrong, doesn’t it? There’s an awful lot of repetition here, and if we ever change the class’ API, we’d have to make the change in 4 locations (for now). The advantages of DRY are starting to show even in tests. Well, there’s a feature to help with that. We first wrote a new method called conversionSuccessfulProvider. This hints at the expectation that all the provided cases should return a positive result, because the output and input match. Data providers return arrays (so that the test function can auto-iterate through elements). Each element of this array is a single test case – in our case, each element is an array with two elements: the former is input, the latter is output, just like before. We then consolidated the test functions into a single one with a more generic name, indicative of what’s expected: testStringConversionSuccess. This test method accepts two arguments: input and output. The rest of the logic is identical to what it was before. Additionally, in order to make sure the method uses the dataprovider, we declare the provider in the docblock of the method with @dataProvider conversionSuccessfulProvider. That’s all there is to it – we now get the exact same result. If we now wish to add more test cases, we only need to add more input-output pairs into the provider. No need to invent new method names or repeat logic. Convenient, right? Before we sign off on this part and let you absorb everything we’ve covered so far, let’s briefly discuss code coverage. 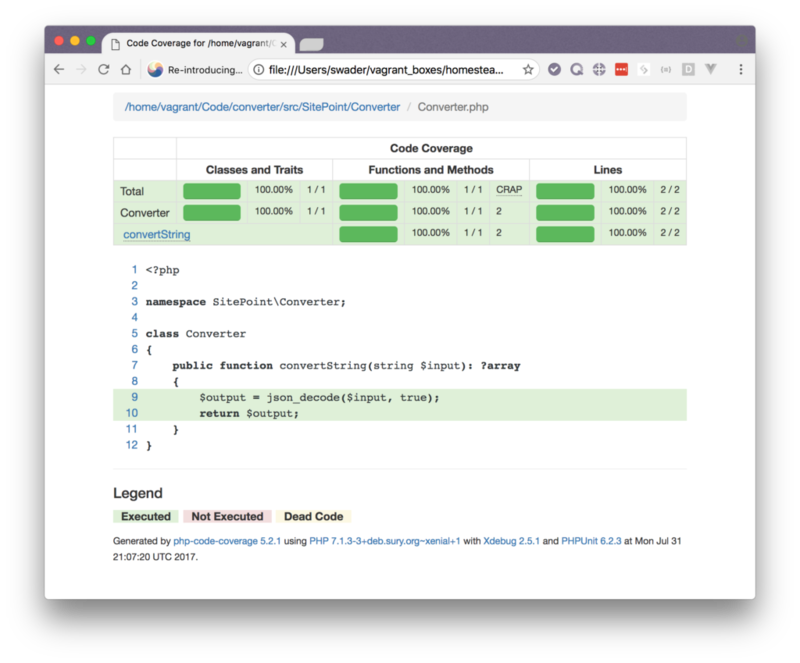 Code coverage is a metric telling us how much of our code is covered by tests. If our class has two methods, but only one is ever being tested in the tests, then our code coverage is at most 50% – depending on how many logical forks (IFs, switches, loops, etc.) the methods have (every fork should be covered by a separate test). PHPUnit has the ability to generate code coverage reports automatically after running a given test suite. Filter sets up a whitelist telling PHPUnit which files to pay attention to while testing. This one translates to all .php files inside /src, at any level. Logging tells PHPUnit which reports to generate – various tools can read various reports, so it doesn’t hurt to generate more formats than one might need. In our case, we’re really just interested in the HTML one. If you’re not using HI, follow XDebug installation instructions relevant to your OS distribution. This article should help. Re-running the suite will now inform us of generated coverage reports. Additionally, they’ll appear in the directory tree at the specified location. Let’s open the index.html file in the browser. 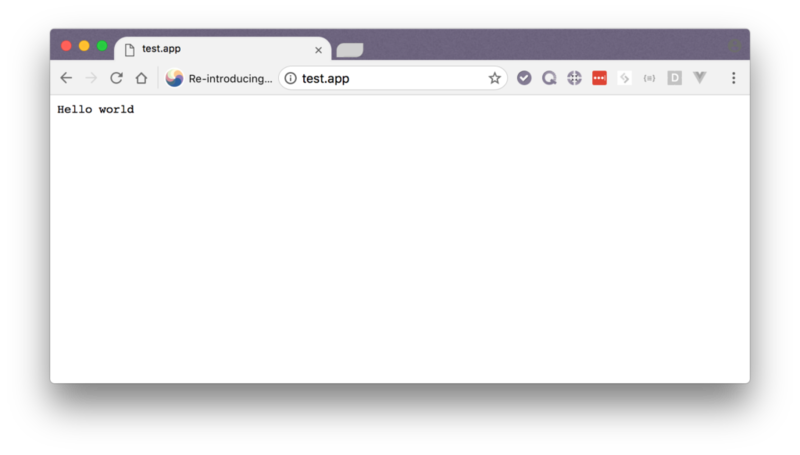 Straight drag and drop into any modern browser should work just fine – no need for virtual hosts or running servers – it’s just a static file. The index file will list a summary of all tests. You can click into individual classes to see their detailed coverage reports, and hovering over method bodies will summon tooltips that explain how much a given method is tested. We’ll go into much more depth about code coverage in a follow-up post as we further develop our tool. In this introduction of PHPUnit, we looked at test driven development (TDD) in general, and applied its concepts to the starting stage of a new PHP tool. All the code we’ve written can be downloaded from Github. 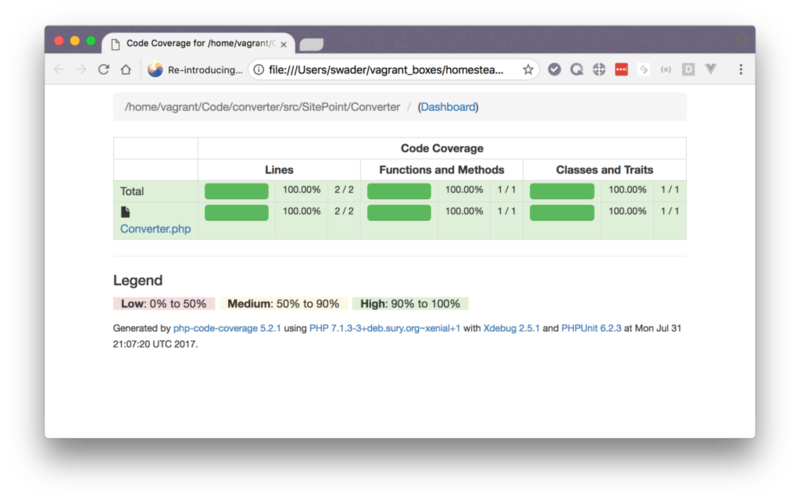 We went through PHPUnit basics, explained data providers, and showed code coverage. This post only touched on some of the basic concepts and features of PHPUnit, and we encourage you to explore further on your own, or to request clarification on concepts that you deem confusing – we’d love to be able to clear more things up for you. In a followup post, we’ll cover some intermediate techniques and further develop our application. Please leave your comments and questions below!